When I decide to review a program, I usually do it within a few weeks of receiving it. Thus, it's a little odd to be reviewing a package that I've used for such a long time. Oh, the software in question only shipped about three months ago, but as of this date I've been using various versions of it for some two years (as a tester)! Therefore, I feel pretty well qualified to review the package. I am referring to Epyx's Art & Film Director, which contains two independent, but interrelated programs. Art Director is a powerful paint program used for creating pictures and/or backgrounds and material for Film Director, the animation program that accompanies it. I'll refer to each program as Art or Film from here on. A quick aside: Separate versions of each of the programs in this package are marketed in Europe, but these are not the same versions sold here. Epyx's versions are more powerful and redesigned. All versions of the software were programmed in Budapest, Hungary by programmers at Novotrade Software. Let's look at Art first. At a glance its list of features looks similar to those of DEGAS Elite (DE). True, there's a lot in common, but Art goes more than a bit beyond DE in a number of important ways. First, at maximum DE allows you eight workscreens; Art allows 16 (two if you have only 512K). To make these multiple screens more useful, Art contains a number of tools for copying pictures, palettes, pixels, etc., from one page to another. One mode lets you "scrape" away part of one page to see through to another. Art also allows you to treat two pages like one canvas, scrolling to work on the junction between them. (You can also print both as one image.) There is even a function that allows you to slide the current page around the screen, making whatever disappears off one side of the screen reappear on the opposite side! As for color, while Art does not allow more than 16 colors at any one time (like Spectrum 512 or Quantum Paint), you are not trapped to only 16 for an entire picture all the time. For every picture you can define up to eight separate color palettes, each of 16 colors, and then cycle them on the screen. In this way you are not just rotating the color values into different positions on the palette (as in DE), but can actually change the colors. If you wish to print a picture to a standard printer, there is even a "mono" view mode that will show the current picture in gray scales, allowing you to get a preview of how it will print. Aside from the usual tools for drawing freehand, making geometric shapes and the ability to copy chunks of the screen to stamp down, draw with or resize/distort, there are a plethora of tools not found in other ST paint programs. For example, the major difference in Art is that when you create a "brush" (the equivalent of DE's block), you can use it with almost any tool, including, but not limited to, such functions as circles, lines, airbrushing, stippling, etc. One major point is that you can use any brush as a fill pattern, no matter what its size. This is in contrast to DE, which limits you to fill patterns that are exactly 16 × 16 pixels in size. You can cut out rectangular, oval and irregular (freehand) brushes and draw, paint or fill with them. Fortunately, Art's brushes, even when they're as big as the entire screen, don't blink as annoyingly as they do in DE. One additional nicety about Art's fill is that you can toggle it to a mode called "fill contour," which will fill with the current color or brush, overwriting everything that is not the same color as the one currently selected in the palette. In this way you can fill over multiple colors or even other fill patterns! There are many tools for manipulating parts of your pictures. For example you can rescale, stretch and rotate images, in addition to bend them to look like a half cylinder, distort them by repositioning the four corners of the source fragment or even bulge a circular image so that appears as if viewed through either a convex or concave fish-eye lens (you determine the severity of the effect). There is even a perspective mode that allows you to select a vanishing point and will then plot any source graphics fragment in perspective relative to that point. For example, to draw the cobblestone for the cover of last February's VideoGames & Computer Entertainment, I drew an overhead view of a patch of cobblestone, then used perspective to lay out the pieces on a grid-like tile! Art managed all the diminishing sizes for me. Furthermore, Art provides tools for lightening and darkening colors locally (this replaces the selected color with another color in the palette that is the closest thing to a lighter or darker shade of the color), meaning you select the area where the shade changing will occur. Furthermore, there are tools for replacing one color with another or swapping any two colors. There are also functions for pulling all the pixels of a selected color from one picture to another, allowing you to combine images in interesting ways. You can also outline all areas of one color with a borderline of another color. And, in addition to these being global effects (which work on your entire picture), you can limit the area of the picture they will effect by using a special window mode. Fonts are not the usual ST or GDOS fonts, but actually screens of text that you load on one page and can type with on another. 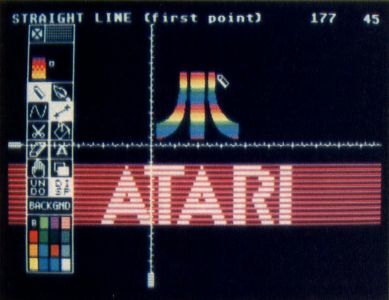 Thus, you can have letters from normal size all the way up to a huge 32 × 48 pixels, in colors from a single one all the way up to the system limit of 16. Furthermore, by using these "font pages" for other graphics, you could make libraries of clip art you could then "type" on other pictures. Art can tell a font file by certain bits that are set in its header. If you copied a font page to another screen, modified it and saved it, the program would not recognize it as a font file when you reloaded it, because the screen you saved it from did not contain the font-definition information. This is an annoyance, and you should be able to force the program to treat the screen as a font of a given size if you so desire. The program even features odd little functions for ping-ponging (sprite) a small part of one page atop another and another feature for spinning part of a picture as if it were printed on a card. An interesting animation function is also supported using this spin mode, but unfortunately Epyx did not include an appropriate example page with the program (the file in question has to have certain bits set to tell the program what it is for), nor is this function hinted at in the manual. One of the main uses for Art is to create graphic elements that are collected on screens/pages, often called "shape tables," which are saved to disk and then imported into Film Director for animation purposes. 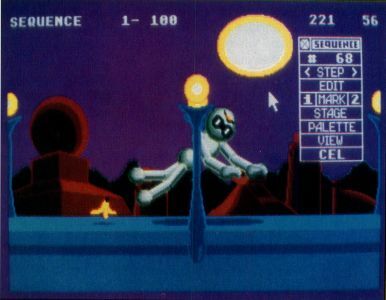 Film is an animation program, but one with little similarity to something like Cyber Paint. It is a "cel" animation system, which refers to the fact that various images are treated as if they were stuck on sheets of transparent material, known as a eel in the animation biz, which can be placed over other eels and/or backgrounds. These eels can be arranged into predefined "loops" (repeating sequences) of animation or manipulated individually over a series of frames to create the movements necessary to create the illusion of movement. Film uses two basic building blocks: the polygon and the pattern. A polygon is just a closed, unfilled geometric shape composed of lines (each of which can be a different color). Unlike those of Aegis Animator ST, Film's polygons are not dealt with on a frame-by-frame level and are neither as powerful or as useful. Then again, they are not the main function of Film, as they are in Animator ST. The primary unit is called a pattern, which is a block of graphic data you clip from a pattern page (usually one drawn in Art). A page might contain various positions of a puppy's body and a separate set of heads that you "cut" out to make patterns. You can assemble multiple patterns and/or polygons to make more complex elements, such as stages (backgrounds), groups (multiple items treated as one object) and actors (a sequence of groups/eels treated that can be automatically recorded). To make things a little easier, the program can automatically generate in-between forms for polygons (you define one as the start, a second as the end, and tell Film how many intermediate forms you want), in addition to positioning and selecting eels in groups, stages, frames, etc. There is even the ability to interpolate inbetweens on existing frames without effecting the animation already defined. If it sounds complicated, don't worry, it is! But the complexity shouldn't scare you off. The reason that the program is complex is because it's powerful. Film contains seven different editors for defining patterns, polygons, groups, actors, frames, sequences and color palettes. This might sound extreme, but it allows you complete control over your animation. Changes in one editor are immediately reflected in another. If you delete a pattern from the pattern editor, that pattern will vanish from any group, frame, etc., it appeared in. This is very handy. Furthermore, because of the way Film stores and plays its animation, it is possible to stop in the middle of it, change something and then run it again. The sequence editor is one of the most useful. It allows you to define a starting and ending frame and carry out certain operations on all frames within that range. For example, you could change the stage or palette on a series of frames, turn on the trace mode (which does not erase the previous image before drawing the next, leaving a trail of afterimages), overlay the eels from the range onto other frames, or even peel the top layer of eels off of every frame in the sequence! Film also contains its own simple drawing tools in the pattern editor, allowing you to add items or edit them without having to save your work and return to Art. This can save a lot of time. It is difficult to describe a program like Film adequately. As the old saying goes, actions speak louder than words. What I found Film particularly good at was animating cartoon characters and creating flat, stylized animations. The main advantage is that you can make minute manipulations all the time, adjusting elements, all without redrawing (you just replace and/or reposition eels), allowing you to refine animations endlessly. By building sufficiently complex shape tables, you can make detailed and flexible characters (this is not as easy if you only have 512K). Film cannot be said to compete against the Cyber Studio (CAD-3D\ as the animations it generates are of a different ilk entirely. However the type of animation it was designed to do, it does very well—and better than you could do with any other ST animation program. The programs come with a small utility for converting DEGAS (it claims "Elite," but it will not convert compressed DE files), Neochrome and Art format files from any format to another. While this is nice, it only converts one file at a time and doesn't automatically remember the source and destination paths for the conversion when copying multiple files. One small annoyance is that Film's animation files are in a format that cannot be ported to other formats. It would be nice to see a utility to convert a Film file to something like a Cyber Paint delta or sequence file. Both also come with stand-alone player programs that can be freely distributed. Unfortunately, the ARTSHOW slide show program must be in the same directory as the pictures to be shown, as you cannot select a path from which to show pictures. Both Art and Film use a mouse-driven GEM-like user interface, with drop-down menus and dialog boxes. One nice touch is that the menu bar does not appear until you want it to, which allows you to see your whole picture at once. You can set the mouse pointer so it will be restricted to the visible screen or will be able to move beyond its edges (useful for dragging items partially off screen), and toggle on or off warning messages. Both programs have toolboxes for selecting common tools, and these toolboxes can be moved horizontally across the screen or removed entirely. I particularly like the toolbox in Art, because you can select a tool by left-clicking on its icon. Right-clicking on the same icon gives you access to a box that allows you to select the settings and options for the tool. Very nice. Both programs allow you to toggle on status lines that report the current tool (often explaining which step you are on) and the coordinates of the mouse pointer (for fine positioning). Also, in both programs you can turn on a set of "rulers" that appear along the screen edges. The manual fails to note that these rulers can be moved by clicking on and holding down the left mouse button while pointing at the small block at the root of each ruler. You can therefore use the rulers for lining up elements in your drawing or while animating. Another nice feature is that just about every function in both programs can be called into action with a keyboard command. I heartily recommend learning these as it speeds up your work by severalfold in the long run. Oddly enough, for programs that are so mouse-dependent, you are forced to type either a Y or an N to confirm quitting the program. This is inconsistent. Now we get to some of the problems with the programs. First and foremost, both work in low resolution only. You can't even run them from medium resolution (which is a simple thing to do). Worse than these other problems, both programs (along with their stand-alone "player" programs) are hard addressed, meaning they are designed to load at specific places in your ST's memory. Thus if something else is residing there, like a desk accessory or program you ran from your AUTO folder (like Templemon or UIS II,) when you try to run Art or Film, the programs will not load! The only way I have discovered to circumvent this is to have a machine with over 1024K (I have a Mega ST4) and use CodeHead's TopDown loader (which forces accessories and AUTO programs to load at the top of RAM, out of ArtlFilm's way). This solution doesn't seem viable on machines with one meg or less RAM. Another problem is that Art and Film do something slightly wrong when calling up GEM alert boxes and menu bars. Occasionally you will hear a sound like a key being held down. It only lasts an instant, then stops. The reason it stops is that the programmers shut off the ST's key repeat, so the programs have no key repeat at all. If you want to move your mouse pointer using the arrow keys, you'll have to tap them over and over! (One way around this is to call up the Templemon monitor (if you have it—it's public domain) from inside one of the programs and switch the key repeat on by using the command ":484.7" [sans quotes]). The manual is about 150 pages long, and pretty good, all in all. Unfortunately, some details have been missed (such as the aforementioned fact that you can move the rulers), and there are some flat-out errors. The keyboard command guide for Art omits some information regarding that you must already be in a specific mode before the commands listed will work. Also, the section on videotaping your animation mentions only STs equipped with composite video output jacks—which just don't exist! Big bothers all, but not insurmountable ones. Interestingly, this package marks Epyx's first step into applications software on the ST. If the product does not go over well, it may also be its last, which would be too bad. As of this date the programs have been available for over three months, and Epyx hasn't advertised them yet. Perhaps it doesn't realize that most ST users won't buy applications software if they don't know what it is. Finally, should you buy this package? Well, if you are a serious graphics enthusiast and particularly if you are interested in animation, I'd say go ahead. You can do some amazing stuff with this software if you try. I've created game graphics and fully animated cartoons with it. Furthermore, you're getting two programs (four single-sided disks) for $79.95 retail, which isn't a bad deal at all. Even better though is the fact that this package is often discounted to about $50 or slightly less. Good stuff—if you can live with its idiosyncracies.